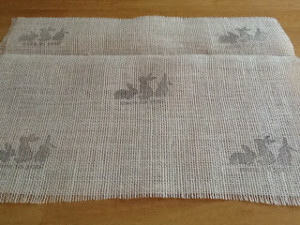 I decided to make some burlap placemats with the leftover curtain material. I used stazon-on ink to stamp the cute little Easter bunny and to get longer use, I stamped flowers on the other side! 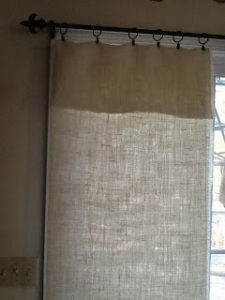 I am loving burlap lately and was inspired by all the posts I’ve seen on Pinterest so I thought I would try some curtains for my eat in kitchen area. They were so easy to make. I purchased the creamy white burlap at Hobby Lobby with my 40% off coupon of course!